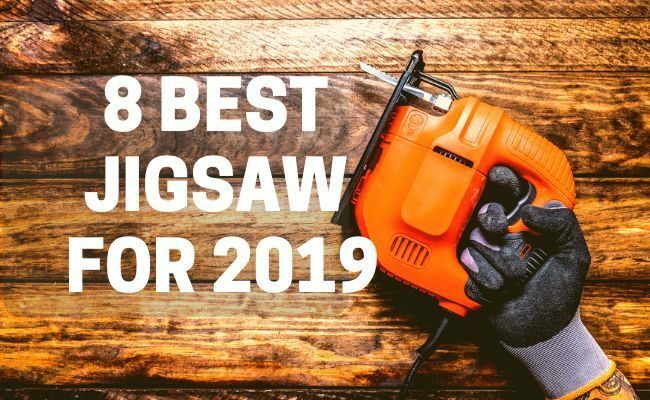 We might look for best jigsaw when we really need it.Every DIY’ers and wood workers should have a jigsaw, at least that is my opinion. There will be times that you need to trim a piece of wood down, or even cut a design. If that is the case, then you need to consider getting a jigsaw. This power tool makes for a wonderful addition to any power tool collection. It’s not only for seasoned professionals, either. Even a novice can make excellent use of one of these handy tools. But which jigsaw should you choose? In today’s market, the variety is massive and you may find it difficult to differentiate the quality jigsaws from the cheap ones you should avoid. If you are like me, you can’t be bothered with going to the local hardware store to compare tools. I much prefer ordering my gear online and having it delivered right to my door. I’m basically in love with Amazon.com. 10 How are jigsaws used? 11 So who needs a jigsaw? 13 Which jigsaw blade should you choose? This first option up on our list is the best corded jigsaw, if not the best jigsaw all together, that I could find on Amazon. My favorite thing about the Bosch js470e is its convenience and ease of use. It features a tool-less system for changing out the blades. This system allows for quicker changing with the use of the integrated ejection lever, which makes it a breeze to use. Not only that, you never need to touch a hot blade or wait for it to cool down again. Four different blade strokes are also available in this model. It has a 4-in-1 tool setting that will help you to achieve either more aggressive or smoother cuts depending on the need. There is also a variable speed dial. This allows you to set a maximum blade speed. The accelerator trigger is also used to control the operating speed. Another great aspect of this tool that is often overlooked in other models is the ambidextrous lock-on button that helps to provide more steadiness and comfort for the user. This model also has a large and sturdy die-cast foot, which includes a steel insert as well as an on-board level wrench. The multidirectional clamp for the blades provides for an excellent grip for your T-shank blades. This helps to ensure that the tool cuts accurately every time. The precision machined internal plunging system incorporates a design that helps to limit vibration. The helps increase accuracy and helps to ensure that you get smooth cuts when you need them. This particular set comes with the jigsaw itself, as well as a blade, a plastic overshoe, a bevel wrench, an anti-splinter insert, and even a carrying case. 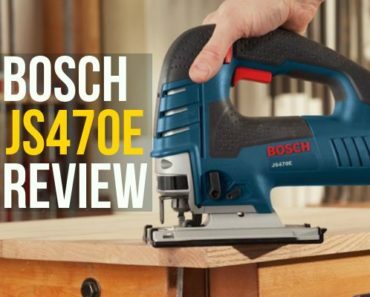 Whether you are a beginner or a seasoned professional, you will absolutely love this jigsaw from Bosch. 0 to 45 degree bevel cutting capacity. Adjustable dust blower keeps cut line clear. Next up on our list is a jigsaw by DeWalt. The DeWalt 20v jigsaw is, at least in my opinion, the best cordless jig saw that you can get. This battery powered jigsaw, available on Amazon, has many beneficial features. For example, it incorporates an all-metal keyless blade changing lever. For anyone that has had to slow down on the job to wait for a hot blade to cool down, this is a boon. You no longer need to fiddle with this blade or wait for it to cool down. It also has a 4-position orbital action and an all-metal shoe bevel that is also keyless. This bevel is able to cut at 0 degrees, 15 degrees, 30 degrees, and even 45 degrees. This makes bevel cutting a breeze. I’m also a huge fan of the anti-slip grip. This grip provides ease of control and the comfort you expect from a tool you may have to use frequently. This model also accepts t-shank jigsaw blades. This helps you to get professional looking results without all of the experience that many feel is necessary. If you specifically want a cordless jigsaw, then this is my recommendation for you. It is powerful, robust, and can definitely get the job done. And being portable definitely increases its useability. Now, it is important to note that this version does not come with the battery. You will need to purchase the battery and charger for this battery powered jigsaw separately. Ideal for cutting wood,Metal and Plastic. Now, those first couple jigsaws are great, if not the best available. However, they can be a bit out of your price range. Don’t fret. You don’t have to settle for something that will fail on you after just a few uses. This black and decker jigsaw is the best jigsaw for money. And that isn’t the only thing that this tool brings to the table. This tool incorporates curve control technology. With this, you can actually adjust the orbit of the saw in one of four different customizable settings. It also utilizes a 5 amp motor with variable speeds, which has a cutting power of up to 3000 SPM. You will also be able to cut 45-degree bevels. The shoe is also adjustable for increased stability. In addition to this, the wire guard is new and improved and provides you with a clear line of sight. I also really like the inclusion of a dust blower. The wire guard and the dust blower both help to ensure that your surface area stays clean and that your cuts are smooth and as straight or curved as intended. As with other options on this list, this jig saw comes with a tool-free blade clamp for quick and easy blade changing. With the ability to cut several different material types at the angle of your choosing makes this a wonderful addition to your collection. If you are looking for a less expensive option, then this is the best budget jig saw for you. Perfect for cutting Metal, Plastic and Wood. Coming in at number four on our list is the SKIL 4495-02 jigsaw. This jigsaw uses a powerful 6.0 amp motor, which definitely gives it the power you need to cut through most materials. It also comes with an incorporated laser guide. For anyone that has used one similar to this, you know that those laser guides are an excellent addition. It also incorporates a four position orbital control for your cuts, ensuring that you get fast and smooth cuts every time. The variable speed trigger also helps with this, allowing you more control over the tool. The tool rest is also custom molded. This is done to help prevent the tool’s blade from damaging the material in any unexpected ways. If you are looking for a jigsaw with power and precision that is capable of giving you smooth cuts and that won’t break the bank, then you should definitely check out this Skil jigsaw. Its robust design will ensure that it is a trustworthy tool for years to come. Laser guide and LED light illuminates the line of cut for increased accuracy. If the budget is one of your primary concerns, then you should look at this jigsaw from TackLife. It incorporates a very powerful 6.7 amp motor that is pure copper. It rotates consistently at just over 3000 strokes per minute. The design of this model helps to ensure that it generates less heat than comparable versions. It also incorporates a variable speed dial, providing you with six different speed options. This means that you can actually match your speed to the job or material type, which is absolutely necessary for professional looking work. This model also comes with six jigsaw blades. This means that the options available with this tool are plentiful right out of the box. Like the other entries in this list, this tool utilizes four position orbital operations. This means you can cut a variety of materials more aggressively then you can with some other models. The transparent guard and the dust exhaust pipe also help to ensure that you get straight cuts. This model comes with the TackLife PJS02A jigsaw, the metal guide ruler, an allen wrench for adjustments, a carrying case, the six-count jigsaw blades, and the dust exhaust pipe. This is definitely a good saw for the price. This Makita cordless jigsaw is another battery powered option that you can choose from. The Makita XVJ03Z utilizes a variable speed motor. This motor allows the blade to achieve between zero and 2600 strokes every minute. This means that you are going to be able to cut faster and more efficiently than you can with other models. This one comes with an adjustable 3 orbital setting. This, along with its standard straight cutting, ensures that you can use this tool for a wide range of projects and materials. You can also swap out the blade by utilizing its no-tool blade changing system. This means that you can remove and replace the blades much quicker then you can with other jigsaws, improving your efficiency and productivity. This tool also utilizes a larger, two-finger trigger with variable speed capabilities. This makes the cutting process much more convenient and enjoyable. The base is precision machined from heavy gauge metal. This makes the base smooth, which ensures more accurate cutting and durability. This jigsaw from Makita is powered by an 18v lithium ion battery, however it is important to note that this model comes with the tool only. You will need to purchase the battery and chargers separately. Up to 45 degree bevel cut. This Porter Cable jigsaw is another option that you may want to consider. It is a bit lower on the price, which makes it a more viable option for many people. It comes with 3 orbital settings, which helps you to make those more aggressive cuts, making it a versatile tool for almost any job. It also incorporates a variable speed trigger, which is able to move the blade up to 2500 times each minute. Like some of the others on this list, it also comes with the tool-free blade replacement system. This is a great feature, as it helps this tool to become more versatile and efficient. The included dust blower helps to keep your work area and cutting surface free of dust and debris. This ensures that you are able to get beautiful clean cuts where you need them.But there is no option to turn dust blowing feature off until power turned off. This saw has versatility of cutting different cuts including Straight cut, scroll cut in wood & metal ,bevel cut in wood, Sink cutouts, Cutting PVC pipe, Cutting up to 1.5″ copper pipe. Another great feature with this jigsaw is the fact that it is part of Porter Cable’s 20-volt max system, meaning that if you already have batteries and chargers you won’t have to repurchase any. However, if you do not then you will have to purchase those separately, as this model comes with the tool only. Soft grip handle and ergonomic design. The final entry on our list comes from Bosch again. This one also has an excellent user control. It is designed with a precision-machined plunger system. It also incorporates internal precision control. These all help to ensure that you get a lower vibration jigsaw then what is offered by many competitors. The no-tool blade changing system is also a welcome feature of this model. This jigsaw is powered by a 7 amp motor that is best in class. This allows the blade to cut up to 3100 times every minute. It also includes a dial that can be adjusted for variable speeds with having cutting capability up to 5-7/8in. on wood and up to 7/8in. on Aluminium. The ergonomic design makes this a favorite of many people. The soft grip handle helps to ensure that you maintain maximum control while cutting. Best of all is the consistency that you get from this tool due to its sophisticated internal electronic circuitry. 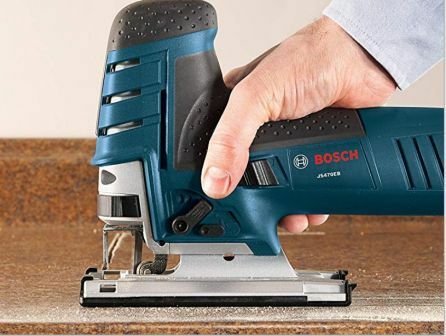 The Bosch JS470EB Barrel-Grip Jig Saw is able to make smooth, clean cuts every time. Just beacuse the plunging system of this saw was designed for low vibration. That is as long as you are using the appropriate blades for the material or project. A jigsaw isn’t necessarily that specialized of a tool. Specialized tools are typically only used for one or two types of projects. The jigsaw, however, is different. It can be used for a large variety of tasks. For example, if you are wanting to install new countertops then the jigsaw is going to be your best friend. This is going to aid you in cutting out holes to fit your various faucets and spray hoses. These small round holes are easy work for someone with a good jigsaw. You can also use a jigsaw to cut ceramic tile. Cutting curves into tiles becomes a piece of cake with the correct jigsaw blades. Now, a tile cutter does make for an easier job, but if you don’t have one then just pull out the trusty old jigsaw and put it to work. So who needs a jigsaw? So how do you know if a jigsaw is right for you? Well, that depends entirely on the project that you are doing. If you need to cut curves or designs into ceramic tiles, wood, carpet, metal, or even concrete, then you should definitely get one. If you aren’t sure if you need one or not, then I still recommend getting one. It is better to have it and not need it then to need it and not have it. Fortunately, you don’t have to shop around. Here are the top eight jigsaws that I could find on amazon.com. Choosing the right jigsaw blades can be just as important, if not more so, then the tool itself. The first thing you need to consider is what type of material you are cutting. Most jigsaw blades have a color scheme, although this may not be the same for every brand. Bosch, for example, has grey for wood cutting, blue for metal cutting, white for both wood and metal cutting, and then black for specialized cutting applications. There are some more considerations outside of the material you are going to be cutting. For example, what kind of cut are you going to need? You are going to need a different blade for cutting different kinds of geometry. You also need to consider the kind of teeth on the blade itself. For example, you would go with milled and side set teeth if you are wanting to make quick cuts in both soft and hard woods, plastics, aluminum, and even non-ferrous metals. Milled and wavy set teeth, on the other hand, are used for fine and straight cutting in materials like plywood, aluminum, plastics, and soft steel. Ground and side set teeth are used specifically for making quick cuts into wood. Ground and taper teeth are used in order to make clean and fine cuts into both wood and plastic. These are just a few of the options that are available to you when it comes to choosing your jigsaw blade. Make sure that you do the appropriate research so that you are using the correct blade for your project. Using the incorrect blade type can result in damage to the blade, the jigsaw, and possible the material you are cutting. If you are going to need an angled cut, say for the edge of a dining table, then you are going to need a tool that can cut at the appropriate angle. By choosing the appropriate jigsaw you can easily get those cuts, and make them look professional while you are at it. You are going to want to look for a jigsaw that is able to cut a bevel up to 45 degrees. These jigsaws do this by having an adjustable angle from the base so that the base stays flat but the tool itself sits at an angle, allowing for those specialized cuts. This may seem like a superfluous feature to some people, but it shouldn’t be taken lightly. Without some way to get rid of the dust, it will eventually build up to the point that it becomes difficult for you to see and follow the cutting line. By choosing a jigsaw that incorporates a dust blower you can ensure that your cutting surface is always clean. This helps to make cleaner and straighter cuts and increases your efficiency. Some people just don’t have the dexterity necessary to hold down the trigger on a jigsaw throughout the cutting process. Fortunately, many of these jigsaws have some kind of trigger locking system. This is great because you can depress the trigger, then lock it in place. This allows you to keep the trigger pressed, keeping the blade moving, without you having to continually hold it. If you find that holding that trigger through the jigsaw’s vibrations to be difficult, definitely look for one with a trigger lock system. Much like issues with dexterity, some people have issues with the violent vibrations that come from some jigsaws. You don’t even have to have anything wrong with you. Using a poorly designed one can definitely give your hands and wrists trouble after having used it all day. In order to avoid this, it is a good idea to look for a jigsaw that is designed in order to reduce the vibration that you feel. This is great, especially for someone that has had a previous injury or even arthritis. Having a jigsaw with variable speeds is going to be something that you will be happy about. You can choose a jigsaw that doesn’t have this option, but at a cost. Without being able to control the speed of the blade, you run into a few problems. For example, you may wear out the blades faster or even brake them by mistake. Being able to control the speed of your saw blade is going to benefit you in a couple of ways. For one thing, you are going to see that your blades will last longer when used correctly. Also, the actual cutting process becomes much more efficient with the added control. If you are going to be cutting metal with your jigsaw then you want to ensure that your blades have at between 21 and 24 teeth per inch. This is beneficial in a couple of ways. Let’s say that you have a piece of wood with an embedded nail that you have to cut. Using this type of blade will allow you to cut through both the wood and the steel nail. It can also cut through 1/8 inch mild steel, noniron piping, and even sheet metal that is has a thickness up to 10 gauge. Maybe you have a project that requires plastic to be cut. It is possible to cut most of these plastics with more basic tools, however, if you have the appropriate jigsaw and blades, then the job becomes that much easier. In order to cut plastic, you want to choose a jigsaw blade with between 6 and 13 teeth per inch. Using an incorrect blade can result in the blade braking. Also, a concern with using the wrong blade is over heating. If the blade gets too hot then it has the potential of melting the plastic, which can completely ruin your project. In most cases, people are going to be using their jigsaw in order to cut wood. The type of saw blade you need for this type of work has 10 teeth per each inch. There are variations of this for different purposes. For example, if the count is less then ten then it is typically used for making quick rough cuts in an efficient manner. If the count is higher then you are looking at a blade that is intended to make smoother and better looking final cuts. The blades that have higher numbers are typically used for more specialized purposes. For example, if you want to cut ceramic tile then you are going to want a jigsaw blade with around 30 teeth per inch. These teeth are typically used to cut the angles and curves that are necessary for your tiling projects. Using an incorrect blade here can result in the tile being damaged, which can be dangerous. Always make sure you use the correct blade for the job. Protect your work area – Make sure that when you make a cut you hold the saw down firmly. This will help to keep the blade from chattering, which can cause damage to the blade and the work area. The downward force and vibration that come from a jigsaw can definitely wreak havoc on a work surface. It could be a really could idea to use a layer or two of masking tape on the surface in order to prevent marring and damage. Choose the right saw – This is something that we have already discussed, but that just goes to show how important choosing the right saw is. You want to make sure that whatever you choose is comfortable for you. Many of these tools have pretty large motors, so only purchase one of the high-end models if you need it. If you are a hobbyist or don’t plan on using your jigsaw frequently, then it could be a good idea to go for the lighter and cheaper versions. Cutting square – In order to ensure that your cuts are square and at 90 degrees, you first have to ensure that the blade is perfectly perpendicular to its base. You also have to make sure that the blade itself is straight and not bent. If the blade is bent, then you should probably get a new one, as a bent blade will likely only cause you problems. Good side down – This is one tip that I learned only recently. Most of the jigsaws that you see actually cut on the up-stroke, not the down-stroke. So, if you are cutting something and you like one side better than the other, then ensure that the side you like is face down on your cutting area. This will help prevent marring and damage to the pretty side. Now, you can buy down cut or reverse cut blades. If you have those, then you will want to keep the good side up and use our tape tip from earlier. Sandwich your metal – You already know that you can cut sheet metal with a jigsaw, but it can be difficult to clamp it down properly. Sometimes the material just rattles around rather than getting cut properly. In order to prevent this from happening you can sandwich your metal between two sheets of plywood. Simply clamp the metal between the plywood and then you can get safe, fast, and easy cuts from your jigsaw. Relief Cuts – If you have used a jigsaw before than you know that there is a limit to how sharp of an angle it can cut. This typically depends entirely on the blade that you use. If you want to make sharper turns, then you are going to want to use a narrower blade. Trying to force the blade beyond what it is designed for can result in a miscut or a break in the blade. Starter holes – If you need to cut some specific geometry into something, like plywood, for example, you first want to start by drilling a hole for the jigsaw blade to access. You drill a hole that is slightly bigger than the jigsaw blade in two corners of where you are going to be cutting. Once you do that you are able to cleanly and neatly cut out what you need. Working with tile – These jigsaws are able to cut quickly and cleanly, but when working with tile you have to be especially careful. You want to work extra slow when you are cutting ceramics. It is best to go with a diamond blade for your harder tiles and natural stones. If you are in a rush, then you are going to want to continuously lubricate the cut with water or mist.